It’s the start of a new year, so I thought I’d move forward by going backward. Yeah, I know what I said. When I get self-reflective, especially about my decision to pursue writing, my mind wanders back to what really solidified my love for writing in the first place. And as much as I purport to be passionate about History and my profession as an Archivist, my passion for writing was a result of being a fan of the sci-fi television program Andromeda. 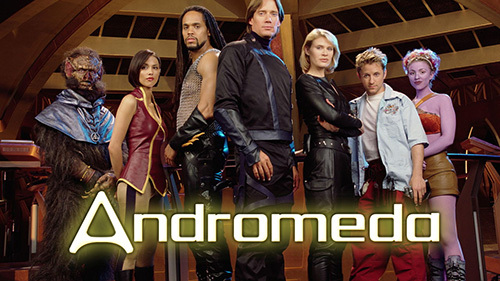 For those of you who somehow missed this gem of a show, Andromeda is about the adventures of High Guard Captain Dylan Hunt (Kevin Sorbo), a man displaced in time, as he tries to rebuild the fallen Commonwealth that once united the galaxies. Along for the adventure are the ragtag crew of the junk ship Eureka Maru – Capt. Beka Valentine (Lisa Ryder), mechanical genius Seamus Harper (Gordon Michael Woolvett), enigmatic alien Trance Gemini (Laura Bertram), and Magog spiritualist Rev Bem (Brent Stait) – as well as Nietzschean warrior Tyr Anasazi (Keith Hamilton Cobb) and the Andromeda’s sentient android, Rommie (Lexa Doig). 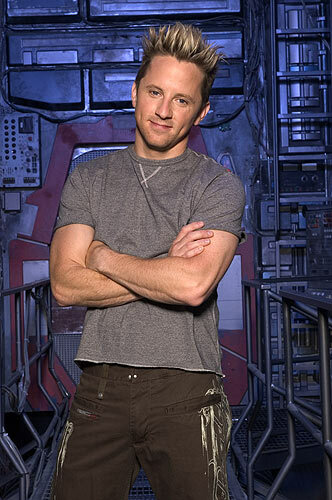 The series was created by Robert Hewitt Wolfe, based on unused material by Gene Roddenberry, and ran from 2000-2005, though admittedly only the first two seasons are consistently good. Might have something to do with Wolfe’s unfortunate departure from the show during the middle of the second season over creative differences with the studio; the bone of contention being Wolfe’s desire to steer away from primarily standalone episodes in favor of long-form storytelling. Why do I know his approach would have been better? Because when Robert Engels was brought in as Wolfe’s replacement, and the episodes became more standalone, it started going downhill fast. Not that there weren’t good episodes during Engels’s run, but the overall quality of the show took a huge dive in the third season primarily where the main characters were concerned. It’s like when Aaron Sorkin left The West Wing at the end of the fourth season and as season five rolled out under new management it was obvious they didn’t understand the characters or how they interacted with each other. The same goes for Andromeda – I’d invested a lot of time in the friendship of Beka Valentine and Seamus Harper only to watch the two characters, who essentially acted like brother and sister, drift further and further apart. Then there was that whole “Hercules in Space” debacle that was the fifth season, but that’s really not worth your time. Okay, backstory out of the way, it was around Wolfe’s departure and Engels’s arrival that I started mulling around a lot of ideas in my head; ideas that focused on how I imagined the characters interacting and how they’d react to events within the episodes. Again, I kept focusing on Beka and Harper because they had the most history within the timeline of the show and yet it went largely unexplored. So, this being the early days of internet fan forums and interactions, I found one that seemed to have the most activity and started writing what were essentially tags to each episode focusing on Beka and Harper. Entitled “Coda”, though not to be confused with Wolfe’s own “Coda” script posted after the series ended, it was my way of getting ideas out of my head and exploring what I thought was a fairly rich science fiction universe. Eventually, the forum shut down (I still can’t remember the name of it), but a new one sprung up, the still-operating ExIsle. If you dare, I’m pretty sure a few of my stories are still posted and awaiting someone’s critique of pieces written when I was in high school. I cringe at the thought of all those grammatical errors and oddly worded sentences. The point is, when I started writing these stories another avenue of creativity opened up to me. I’d written poetry before and a couple of pieces where I experimented with prose, but it was just something I dabbled in, not something I took all that seriously. As I continued to post to ExIsle, I began to focus more on the stories I produced and it was through the process of writing fanfiction that I developed the skills I utilize in my writing even now. The inner perfectionist in me really started to emerge where dialogue is concerned. For those of you who haven’t seen the show, Harper is a hyperactive, fast-talking, socially-inept genius responsible for a lot of exposition and technical jargon. So, naturally, I became attached to the character but it made for a difficult learning curve when it came to writing him. As a fan of the show, I had the benefit of seeing the finished product, the hard work of the show’s writers and the actor bringing the character to life. I felt then that it was only right to try and at least capture Harper’s voice whenever possible. Harper also had a darker past as a slave on Earth that produced a few prejudices and nightmare fuel when dealing with Nietzschean overlords or fearsome Magog, but it was important, at least to me, to keep his sense of humor intact. It was a tension reliever as much as a defense mechanism and it seemed only Beka, Trance, and to some degree, Rev Bem, who could see through him. I think there was also an unspoken challenge in getting Harper’s voice as close to the television show as possible. His voice stood out, which made him both the easiest to differentiate and yet the hardest to pin down. Being on the forum meant I read as much as I wrote and whenever an author managed to capture what made Harper Harper it made the story that much better. In my mind, it meant the author figured something out. They listened to the cadence, the rhythm, and the sound of Seamus Harper and managed to channel it into their writing. It’s a skill I continue to hone as I move towards more prose writing, but it’s just as helpful for writing academic papers as it is reviews. Voice is important; it’s distinctive and if you can figure out a character’s voice, then you can figure out your own. Thankfully, I was never on the receiving end of angry diatribes about how true I remained to the world of Andromeda or whether or not I depicted a character poorly. I was lucky at that moment in time because no one was policing me and my creativity and fan forums were mostly civil. Above all, the people on ExIsle were encouraging and supportive. At one point I had two ongoing stories that I wrote while in college and I tended to publish both on the same day to the point where the frequent readers dubbed that day “Sam Update Day.” It was sweet and it came along at a point in my life where I didn’t have a lot of friends so getting that kind of support and encouragement from people who had the same love for the show as I did meant a lot. Having that connection and the ability to critique without attacking meant I could experiment with the stories and not feel like someone was going to immediately dismiss the premise or a new character. I returned that kindness as well; commenting on stories, giving my opinion, but also being encouraging of new writers and new ideas. We were bound by our shared love of Andromeda and that was all of the credibility required. I really wish it was the same now, but I know that’s not entirely true. So, yeah, that’s pretty much where it started. Every person finds their spark of creativity somewhere, mine just happened to be with wonderfully flawed sci-fi show. I’m certain all of you have one as well!